Don't have the capital to invest in a Full Time Mowing operation yet? Have a golf course you need to ressurrect? Want to try a Premiere Boom Mower for your application before purchasing? Have a remote location to clear prior to building? Have some areas that you only clear vegetation once or twice a year? 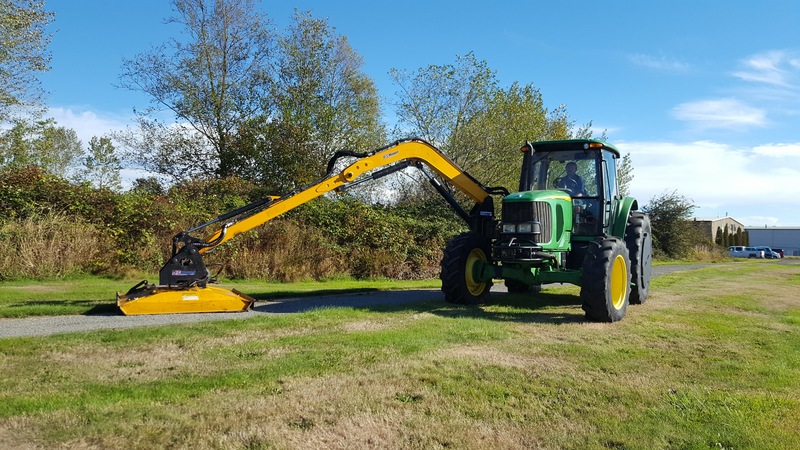 Need an extra mower for a large project or seasonal deadline? Unscheduled downtime on your equipment? We have 2 rental John Deere Tractors with Rotary Mowers ready to rent. Flail Mower available on request. We have shipping connections to transport the units to you, weekly rental rates with daily or weekly extension clauses to make scheduling easy. ​Schedule a reservation and our US Mower Rental Boom Mower will be ready for you with new condition blades ready to mow when you need it. Each summer our units are reserved well in advance. Please contact us asap with your rental boom mower needs. 6615 John Deere with 23' Reach and fully articulating head. John Deere 5101 with a 60" Rotary Head on a 23' Boom. Easy to use joystick with fully adjustable POTS for smooth operation. John Deere 5101 cab with US Mower mounted Joystick. John Deere 5101 in its stow position.